Here’s the deal…These are the before and after pictures of the leather seat cover install we did at The Seat Shop on Thursday, February 24, 2012. This customer brought in his 2001 GMC Extended Cab Sierra to get new driver top and bottom replacement leather seat covers put on. The headrest and armrest were not replaced. They are the original factory pieces that we just cleaned using The Seat Shop’s cleaning method (shown here). This is the factory medium dark pewter leather interior. We also replaced his driver bottom foam cushion with a new OEM one. The density of the new foam cushion will help the new leather cover last a whole lot longer, as well as increase the comfort level for the driver. 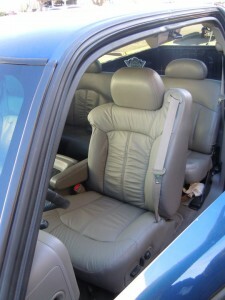 Below are the before and after pictures of the old and new leather seat covers. 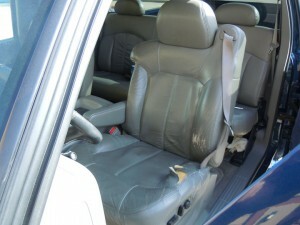 If you have any questions about factory match replacement leather seat covers, or new OEM foam cushions, please give us a shout at 214-710-2565 or visit us on the web at www.theseatshop.com. We would be happy to help!